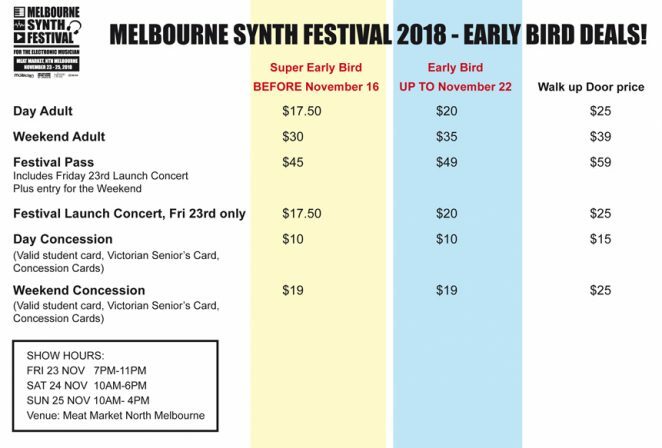 There are a number of ways you can experience the Melbourne Synth Festival and get great value. A Festival ticket will get you a wristband to the Friday Night launch event featuring Luke Million, Emah Fox, Beatrice and Honeysmack. Plus entry to the exhibition and seminars program over the weekend. There are Weekend and Day tickets which include the exhibition and a great chance to see try and buy the latest gear, plus the seminar and workshops program plus 10 great acts live. Exhibition, Pop Up Shop for Gearheads, MESS Tours, Seminars & Workshops and Live Sets all weekend featuring: Chiara Kickdrum, ACM, Emah Fox, Honeysmack, Amelia + Arsenic, The Oddness, Sadiva, Ehsan Gelsi + Sergio Selim and more.